Hennaing a woman after she gives birth was a traditional way to deter what were believed to be malevolent spirits that cause disease, depression, and poor bonding with her infant. The action of applying henna to a mother after childbirth, particularly to her feet, keeps her from getting up to resume housework. A woman who has henna paste on her feet must let a friend or relative help her care for older children, tend the baby, cook, and clean. This allows her to regain her strength and bond with her new baby. She is also comforted by having friends who care about her well-being, and is helped to feel pretty again. 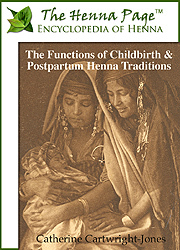 The countries that have these henna traditions have very low rates of postpartum depression. There is more than one way to wash your hair with our shampoo bars. In this short video, Liz, a member of our Customer Service team, demonstrates two easy ways to do it. One of the great things about working for Mehandi is that we, as employees, really do love the products. We use them at home every day. Nearly all of us use Ancient Sunrise® Henna for Hair products to dye and/or condition our hair. We use Ancient Sunrise® hair care and body care products in our daily routines. Many of us use Becoming Moonlight® body art products. Several Mehandi employees are licensed cosmetologists and/or body artists who use the products professionally. We also love to recommend products to our friends and family, and sometimes to complete strangers. Para-phenyelenediamine (PPD) is one of the most common allergens in cosmetics. While genetics can increase chances of allergy, anyone can develop a PPD allergy. High concentrations and repeated exposure increase the likelihood of becoming sensitized. Basic information about PPD is covered in an earlier article, "What You Need to Know About Para-Phenylenediamine. ".